I would make fluffy white frosting instead. That is to say the kind made with sugar syrup and egg whites. @rachel – Hmm, that could be good and still low(er) in calories and fat. These look pretty good for a WW treat! Points sound all too familiar. But you know what? Getting to bake, taste a bite, and then give the treats away is still pretty satisfying. Sorry the marshmallow fluff was so finnicky…the final product sure looks yummy, though! TAH is all over These. More WW Low Point Goodies, Please! I would love to see you experiment with Butter/Oil Subs (Applesauce!) and Things Like That. @The Daily Randi – If you find any recipes that look good, send them my way and I’ll test them for ya. 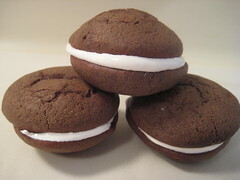 MMMM I love whoopie pies! @jami – Good question. I will edit the post. But yep, they were pretty good! They still sound good to me. I know, fluff is hard to work with. Maybe something like pumpkin butter, or a flavored sugar-free jam whipped into a small amount of white frosting to cut the sugar and fat from the frosting? I’ve been lucky enough to lose my weight through mostly ridiculous amounts of exercise (I don’t think I have the discipline when it comes to food to count points), so good luck in the point adventure. I’m right there with you (counting points) and it stinks!!! I can’t say I’ve tried to many of the WW baking recipes. I would rather have a small bit of the real thing – full fat and calories – then to suffer with an imitation. Best of luck! Hang in there! Can I complain just to complain? I have tried the WW chocolate pudding recipe and it is pretty good. I have also made the WW mini-chocolate chip cookies and they are good, yet tiny. Still, when one is counting points, as I so often am, one takes cookies and chocolate where one can. Good luck with your WW journey! I have been following your website for a while now, but never commented. I had to delurk to say I am thrilled that you are now including calorie-friendly recipes. All of your recipes look delicious, but now I can say they look delicious AND figure friendly! Yay! you can add a couple tablespoons powdered sugur to the marshmallow cream which makes it a little stiffer and won’t ooze when cookies are put together, but ,of course, adds a few more calories and might add another point. I was on the weight watchers core (I think they changed the name now) program for awhile (I go on and off it depending on what “phase” of diet I’m in) and I invented some great treats with fiber one. As long as you don’t try to substitute ALL the flour in a recipe with fiber one, you can do some pretty neat things if you grind it up into breadcrumb consistency. Also, quinoa has some pretty cool tricks but is much harder to work with than fiber one. I’m sure there’s lots of other low-calorie/high fiber/point friendly substitutes but those are the two I used most since they were unlimited on the core program. I make these and put lite whip cream in the middle and drizzel choc syrup just a little and freeze them on a cookie sheet and keep in freezer……the family loves them…………. This recipe looks awesome!! Blend 8 oz. WW’s whipped cream cheese, 8 oz. Cool Whip Lite and a little Splenda and use that as your filling–I use it as a light cake frosting from time to time!